Home » Eye Conditions » Why I need glasses? Why do I need glasses? This page briefly describes the various conditions that result in the need for glasses or contact lenses and will help understand the various Vision Correction conditions available at Centre for Sight. Good knowledge is important and we hope you find this material useful in understanding why you need glasses or contact lenses. Links are provided to give you more detail about each specific condition. How does the normal eye work ? 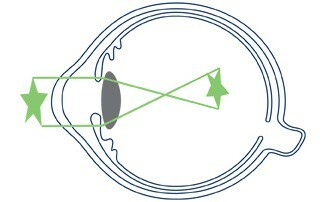 The eye is very similar to a camera and it will be useful to refer to the diagrams below. 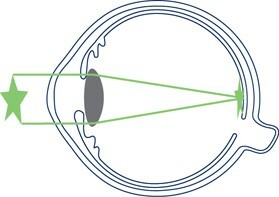 The cornea and lens are similar to the lens in the camera. Both the eye and camera has an iris which controls the amount of light that enters the eye. Light rays enter the eye and 60 to 70% of the focus is performed by the front clear part of the eye, the cornea. The remaining 30 to 40% of focus is by the lens inside the eye. The retina is similar to the film of the camera and light rays need to come to point of focus on this structure at the back of the eye. Information from the retina which has photoreceptors (rods and cones) is passed to the optic nerve and then on to the brain where information is processed very much like a computer and the information is turned into vision. To see well light rays must be at a point focus in the eye. This is where vision without glasses is quite good up close (sometimes very close) but poor at distance. Click for more detail: Shortsightedness. This is where vision is clear at distance and often clear at near. Farsighted people often report having fantastic vision when they were young and then with advancing age, near vision become blurry and in time distance vision also becomes worsens with the need for glasses for both near and distance. Click for more detail: Farsightedness. There are a number of options available to treat all kinds of eye conditions, but they generally fall into 3 categories. What refractive error do you have ? You can write to us with your condition and we will give you an idea of what eye procedure you could be suitable for with some more details if you like. Find out if you are suitable. This will serve as a guide only. It does not replace a thorough consultation by an ophthalmic surgeon who will determine what options are best for you.